Every year, the story repeats itself. As we approach the holiday season, the amount of work increases. As a solo entrepreneur, the only way I can accommodate all of the extra calls is by working on the weekends. Every year, we look forward to the crazy rush of people wanting to get their window treatments in time for the holiday! To be able to accomodate all of our clients, this work week started on Sunday with two sales calls in Milford and Holliston. The products that we looked at with the clients were a variety of different cellular shades and sheer shades. On Monday, I drove over 150 miles between jobs in Jamaica Plain and in Cohasset. In both cases, they were repeat clients. My client in Cohasset recently downsized and moved from Medfield to stay close to the beach. We did 2.5” wood blinds for most of the home and blackout cellular (honeycomb) shades in the bedrooms. On Tuesday, I went to Cambridge to hang draperies for another repeat client that recently relocated from Somerville. In the afternoon, I went to a sales call in Natick where we discussed our Hunter Douglas products including Silhouettes for the bathroom and Vignettes Roman Shades for the dining room and bedrooms. On hump day, despite the fact that it was a holiday, I had seven stops including Norton, Millis, Weston and Wellesley. It was a pretty eclectic day: from installing wood blinds and sheer shades, a consultation for motorized cellular shades, followed by installation of four custom Roman shades and finishing the day by repairing a honeycomb shade in Franklin, only two minutes from my shop. On Thursday, I started my day in Newton on a sales visit for a referral where we discussed Hunter Douglas products including Roller Shades. In the afternoon, I went to Wayland on another sales call for a repeat client that will be moving from Hopkinton. For this house, the topic was Hunter Douglas Applause Cellular Shades with their Top-down/Bottom-up feature and also Everwood (composite material) wood blinds for the bedrooms. The day was completed with a quick stop in Natick to install a cordless cellular shade in the kids bedroom. On Friday the 13th (my lucky day), I started bright and early! 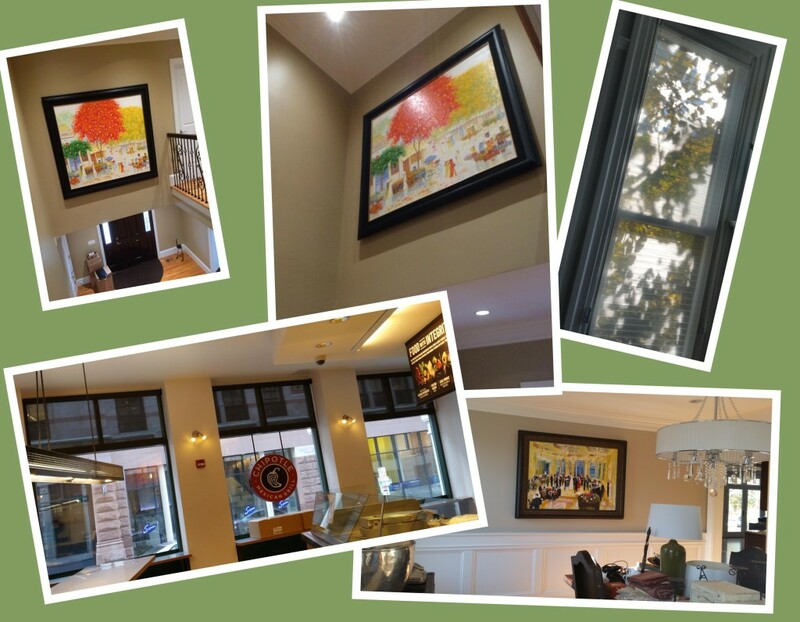 By 7am, I was arriving in Newton for an art hanging job (Yes, we also hang artwork). It was only 3 pieces including a mirror and a large painting in the dining room. But the fun portion was the largest piece that I have hung (to date) over the stairwell. It was 74” wide by 65” tall, and are you ready for this? It needed to be hung 16 feet up from the floor. Hanging this piece was a team effort since the homeowner, John, gave me a BIG help handling it along. In the afternoon I went to Lexington to install custom draperies in a dining room using a custom bent metal rod shaped for a bay window. The day ended at Bertucci’s in Lexington for a nice late lunch with my colleague Julie Murphy, owner of Designer Drapes of Boston. And finally on Saturday (yes, seven days straight), the day started in downtown Boston installing and repairing roller shades for one of my Commercial Window Treatment accounts – Chipotle restaurant on Summer St. From there I went to a quick stop in one of the high rises in the city to hang a large picture in the living room of this super nice apartment. And finally at 3pm, I finished up my week with my weekly deep tissue massage in Natick. After all, even I need a break sometimes!